However, there has been a major backlash against these changes, and some, in particular Supervisor Campos, have called for rollback of this major progress. It is a betrayal of the 65,000 riders who are served by the 14, 14R and 49 buses, as well as a betrayal of the Transit First charter of this city. While I understand the intention was to enhance the commute of 65,000 transit riders, the changes look better on paper than in practice. I have heard from many of you–car commuters frustrated by traffic jams that stretch multiple blocks…That’s why I’m calling on the San Francisco Municipal Transportation Agency to make a radical shift in the program. We look forward to announcing a solution shortly. In the meanwhile, please email your concerns to the SFMTA at matthew.brill@sfmta.com. The paint has hardly dried. Yet the transit only lanes on Mission Street may go away soon. If prioritizing transit is not possible on Mission Street, one of Muni’s key corridors, then will we ever see Muni become world-class system in our lifetimes? But let’s back up a second. Do the business owners who say the transit lanes make it harder to drive to their shops and are keeping away customers, really have a basis to complain? 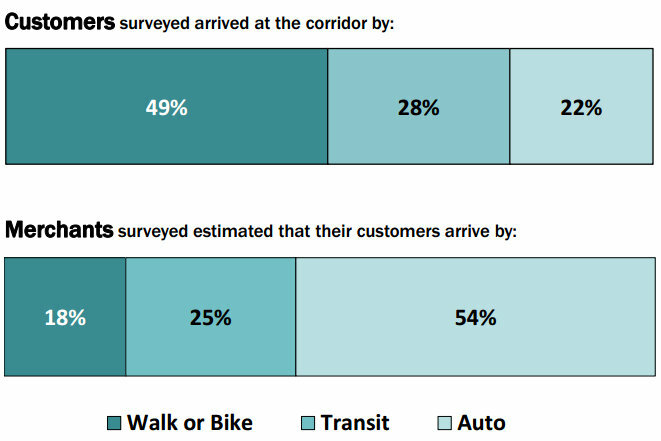 Studies show that businesses tend to get it wrong about how many customers arrive by car. Regardless, figuring how it impacts bottom lines on Mission would be difficult. A sampling of businesses would have to offer their books for an audit. And then if sales receipts really went down from this time last year, it would have to be compared to businesses a few blocks away, to make sure it’s not a reflection of the regional economy. Nonetheless, the businesses that Streetsblog talked with seemed convinced the lane is a net negative. “Oh yeah, we’re down 30 to 35 percent,” said Emin Ali, owner of the Mi Pueblito Market near the 24th Street BART station. Adding he “wants it back like before.” Juan Antimo, the owner of JJ’s Hair Salon, a few stores to the north, was also convinced the bus lane is damaging to business. “My clients complain about it,” he said, pausing from clipping a man’s hair. Another couple of doors down, at Artillery Apparel Gallery, manager Alexa Trevino was eager to talk about the lanes. “Horrible! Bad for business!” she said. “Can’t get anything from delivery.” When asked why delivery vehicles don’t park farther away and use a dolly, she said that dollies can damage the product. Artillery Apparel Gallery seen here with open parking spots and a loading zone right out front. Photo: Streetsblog. Streetsblog is on the record for not approving of how this lane was set up, principally because of how cyclists were basically given nowhere to ride. The confusion that motorists experience about where to turn and where to go straight, might also be less acute if the transit-only lanes were in the center with boarding islands. Part of the driver confusion no doubt stems from flipping the transit-only lane back and forth from right to center, depending on the stretch of Mission, to allow cars to make right turns. If the cars were driving to the right of the transit lane all the time, as they do on stretches of Market and elsewhere, it might be less of a mess at intersections. That said, the markings could be much clearer, as the SFTRU pointed out in an email to Streetsblog. Why are turn signs at Mission & 24th invisible? Why no ped priority walk signal? 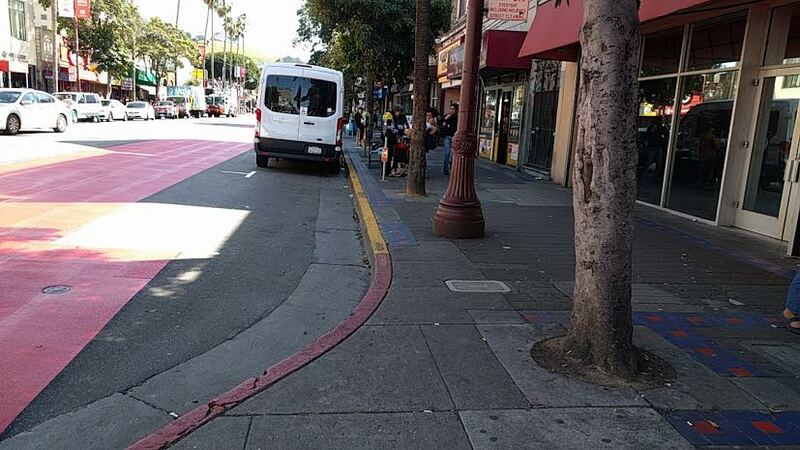 Either way, no matter what SFMTA does, motorists will get grumpy when they lose lanes–that’s why going in with all the incremental half-measures and compromises seems so futile. Compromise results in blowback. Doing it right the first time results in blowback. Let’s save the compromises for later. Streetsblog readers, especially if they live in the district, need to email Campos’s office, hit Facebook and Twitter, and just join the conversation. Because, as “AS Hallowell” put it, yes, “transit first” is supposed to mean transit first. 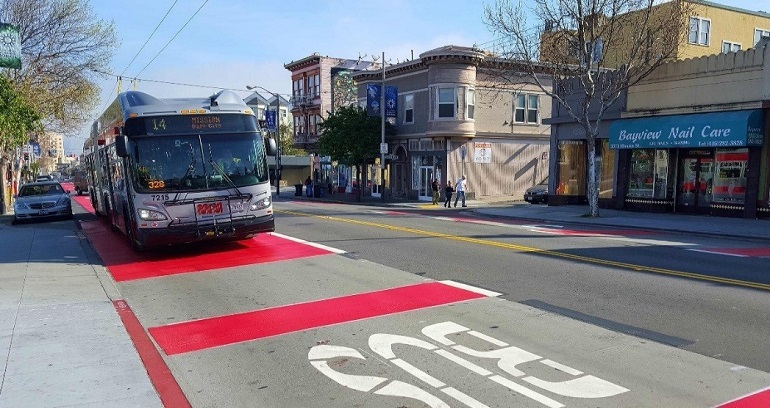 Businesses on Mission want the “red carpet” bus lanes removed because they have eliminated loading zones. Except that they haven’t. Image: Streetsblog. That’s a circular argument. You’re essentially saying that we can’t have a world class transit system like London because we don’t have a world class transit system like London. Here’s the hard fact that people like you need to get over. In order to build a world class bus system, you have to take road space from private vehicles. London has a world class bus system because it did precisely that. The fact that London has more subways is irrelevant; the street we’re discussing in SF is one that actually does have a subway, yet we still need the 14 bus, because subways don’t work for every journey. And guess what, SF’s road structure also date from before the automobile. London’s transit has nothing to do with government imposition. It actually stems from a reaction to the freeway and expressway building that occurred in the fifties and sixties. The horror caused by projects like the Westway caused Londoners to support transit over roads, and to elect officials who also supported transit. It didn’t become a transit mecca by government fiat any more than Copenhagen became a bike haven by government fiat – in both cases, the people demanded it, and held their politicians accountable until they got it. Ironic that you use the example of the Westway because the Euston Road that you cite is where the Westway decants into. And the reason there is no street parking on Euston Road is because there needs to be 4/6 lanes of traffic there. But, crucially, mostly it’s not local and so doesn’t need to stop or park. SF analogies would be Van Ness, Lombard and 19th Avenue. And no, most of SF’s streets were laid out AFTER the auto was commonplace, which is absolutely not true of London. What “people like you” need to understand is that SF has a much more car-centric culture than London. Maybe that will change over time but, if so, it will change because the majority want that and not because a loud minority keep trying to lecture us on what we should want rather than asking questions about what we actually want. In fact, have you EVER asked random SF residents what they want? Please please streetsblogSF, please limit commenters to, say, 3 posts a day. How do you figure that an average Muni ride is $10? A single fare is $2.25 and is good for 90 minutes of travel. That would suggest that you think takes more than 90 minutes to get to a destination on Muni, so it would take four fares to go from home to work/shop, etc. and return. That has never been my experience. Dexter, I looked at the calculation a different way, from the stated costs and farebox recovery ratios for Muni. I’ve read that Muni recoups about 23% of its total operating costs from fares. Since a fare is $2.25 that implies that the true underlying cost of every Muni ride is about $10. You can make adjustments to that for concessionary fares and fare-dodging. But in gross terms it seems about right. A big part of Muni’s problems is that it has high costs, particularly for wages and benefits, but low fares. It’s effectively run as a welfare service. You should have mentioned that in the beginning before putting out the figure. Labor is the biggest part of any transit operation and good workers typically don’t work for less. (One example from Southern California is that LAMTA workers are paid more than Foothill Transit workers just to the north. LAMTA hires its workers directly. Foothill Transit contracts with private companies for workers But those companies have to keep searching for new workers because the experienced workers can move to LAMTA). However for Muni, according to Prop. G, rookies of less than 5 years of service don’t get paid nearly as well as veterans. (That makes things hard for them.) All transit services run on a subsidy (some systems more or less than others). Why and how they are run depends on what the agency wants. Could this also not just be a temporary dip while people become accustomed to the new layout? A change like this takes a few months to set in with the people that use it. Rushing to judgement would be rash here. Look at it again in six months and see how it is working. I don’t know Alicia, why don’t you go ask them? I read the article last week and percentages were given. Someone said their gross business in one of the articles was down 30-35%. Do you care? Some of these mom and pop businesses barely make it month to month. It isn’t just the businesses. Look at the neighborhoods that they have redirected traffic to. It is a mess. There are a lot of people that live in the Mission already. If you want old businesses gone and new condos built, pay the people who’s businesses are getting wrecked. I don’t know Alicia, why don’t you go ask them? So basically, business is down for someone, as mentioned in an article whose title you don’t remember, but you can’t remember the name of the person who said (s)he was losing business. Yes, there are people who live in the Mission. There are many businesses in the Mission. Some of those people and businesses own their property, some do not. You’re suggesting developers should pay businesses who rent to leave? Sorry Roymeo. You are not tracking what I am saying. You do know that Redevelopment Agencies are dead, right? The SFMTA is attempting to do what the Redevelopment Agencies used to do. 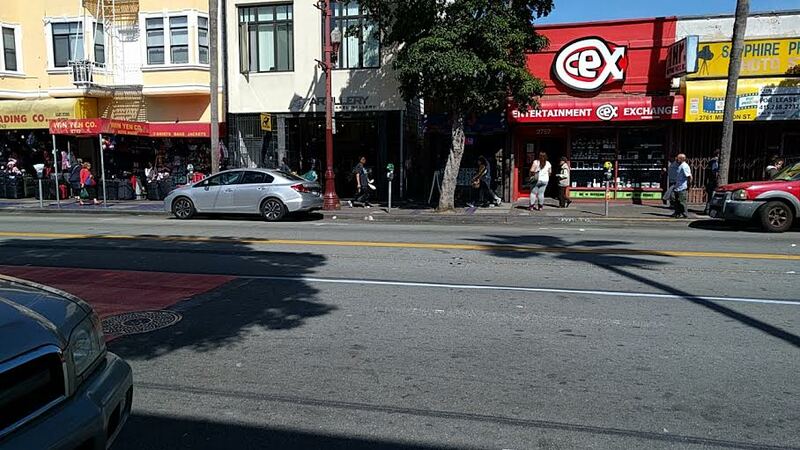 The gentrification of the Mission will occur ten times faster due to the SFMTA making shopping or dining there so bad that no one wants to go there anymore. Watch. Who ever could have imagined we’d get all that hyperbole from a thin layer of thermoplastic! Door-to-door merchant outreach from Gough to 33rd Ave. There is always error in polls, but it’s irrational to ignore the evidence presented by this study that merchants (yes, the owners/managers) are not good at estimated how people arrive to their business. @RichLL – Actually the voters in several counties supported rail coming to the Transbay Transit Terminal from every direction, but these were offered as nonbinding propositions. The work done on the Bay Bridge (both spans) ignored what voters wanted. @bobster1985 – Campos holds a lot of good positions on things, but he caved into the dumb and faux-populist ENUF even before his run for the Assembly. @Jimbo – Why not put the car transportation underground? Just dig a huge tunnel and they can all drive in. Maybe later we’ll raise the funds for an exit tunnel. Problem solved! Campos took a lot of heat from domestic violence groups which Chiu used against him in his campaign for his vote supporting Mirkarimi stay in office. Actually their systems in Europe are horiffic. Privatized is what they are. inefficient. You couldn’t be more wrong. And sanders/trump are not anti trade. They are anti free trade. As they should be. Free trade is these agreements we make with these demons behind closed doors. The largest corporations in the world, and carve out a piece which allows them to sue our government for enforcing laws that will cost them money. Pollution, wage, etc. And it’s anti democratic. These deals aren’t transparent. They’re negotiated by the United States Trade Representative and his office of ex-Citi alums. This is not about trade. It’s about being able to undo any law a corporation doesn’t like. And I hope to god TPP doesnt pass. If it does the constitution will be shredded and we will no longer be a democracy. TPP includes language making it illegal to crack open your cell phone, protest a business, or post something online a company may dislike. It’s a back door to complete fascism. Wow, the arrogance of you Streetsblog people. Even more important to the local businesses than private vehicles are the commercial ones that supply them. What is the problem exactly? Oh right there isn’t one. SF is the only city that makes traffic worse on purpose…these changes are a disaster and have blocked up traffic for miles! There aren’t enough loading zones as it is, and the on street parking sites are all too often the loading zones…. I’m not aware of any changes to loading zones. The picture above shows an untouched loading zone. Regarding arrogance, look at you, dismissing the needs of 65,000 transit riders like they’re nothing, all for some perceived yet imaginary slight. Way to go! Miles!?!? Sure you aren’t exaggerating a bunch? The problem is that we have for over half a century re-modeled our cities around the single most inefficient form of transit (look at the picture again to see how much space cars take up, and we’re not even talking about how much space they need for parking as well), and the second we try to re-work a fraction of that space to be more efficient using public transit, it’s now the fault of the efficient buses that there is so much traffic? I guess the voters will have to decide who they want to run their transportation system. Regardless of who the SFMTA talked to, they got it wrong on Mission Street. They got it so wrong that the folks on Taraval, Geary, 19th Ave, Masonic and Lombard are now screaming STOP!. No more. We don’t want that on our streets and we no longer trust the SFMTA. If you want people to take the bus, removing seats and bus stops is not the answer. If you want people to take the bus, charging extra for “handling” cash, is not the answer. If you want people to take the bus, moving bus stops and shelters around is not the answer. Earth to SFMTA. People do not like change. People like stability. People do not want to get up every morning and look at an app to figure out how they are getting to work today.